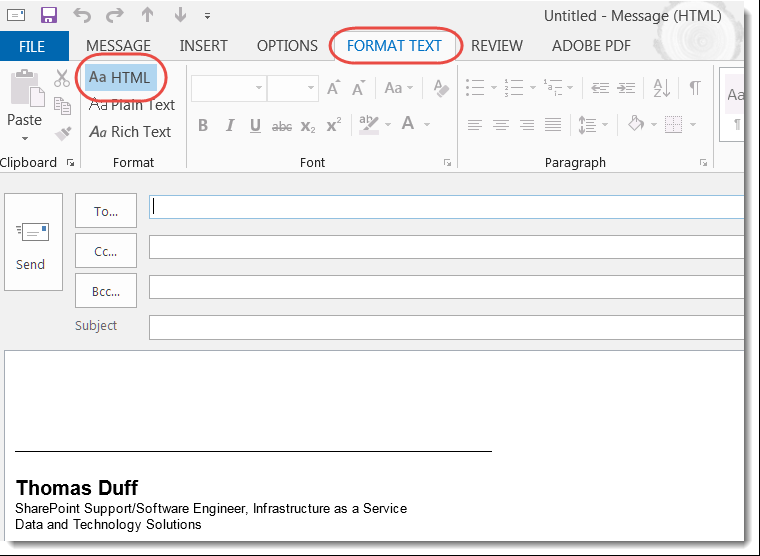 You can add images and colors as the background to emails you create in Outlook. This can be helpful if you need an email to stand out, or even if you just want to be a bit unique. You can also play around with the Gradient, Texture, and Pattern tabs for different effects. MAJOR WORD OF CAUTION! This is a prime example of “just because you can doesn’t mean you should.” While that beautiful (to you) picture of an apocalyptic landscape may appeal to you, that doesn’t mean that your email will be easy to read or look very professional. This is a case where a little (or none at all) goes a long way. Also, if you’re going to use an image, definitely make sure that you’re not using one that’s 4 MB in size. That means that every email you send will be at least 4 MB, and your mail admins (and email recipients) will *not* be very happy.